January 24, 2019 – A rare and important treasure, a small bronze pot holding 24 gold coins and a gold earring, was uncovered at the Caesarea National Park. It was found during the NIS 150 million excavation and conservation project at the site, sponsored by the Edmond de Rothschild Foundation, in cooperation with the Caesarea Development Corporation, the Israel Antiquities Authority and the Israel Nature and Parks Authority. The gold cache was found hidden between two stones in the side of a well, located in a house in a neighborhood dating to the Abbasid and Fatimid periods, some 900 years ago. 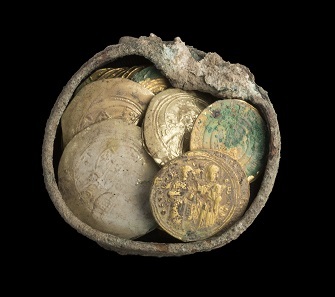 Mixed Fatimid-Byzantine hoard with bronze pyxis, dated to the end of the 11th century. 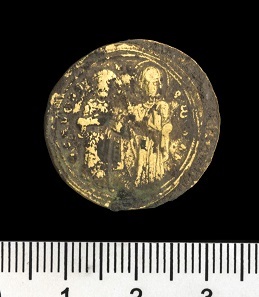 The hoard also contained a filigree earring. In the photo on the left, the improvised ceramic stopper. Photo: Clara Amit, Israel Antiquities Authority. 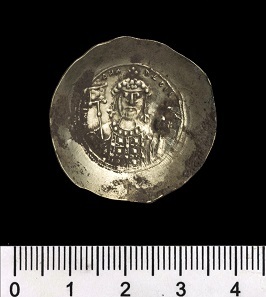 Convex shaped nomisma histamenon of Michael VII Doukas (1071-1079). Photo: Clara Amit, Israel Antiquities Authority. This important discovery was found close to the location of two other treasures of the same period. The first, a pot consisting of gold and silver jewelry, was discovered in the 1960s. The second, a collection of bronze vessels, was found in the 1990s. These treasures are currently displayed at the Israel Museum in Jerusalem. At the center of the excavation and conservation activity of the multi-year Caesarea project, stands the impressive façade of the city’s ancient central public building. It was part of a sacred compound first built by Herod more than two millennia ago, as a tribute to his Roman patron, the emperor Augustus, and the goddess Roma. The newly discovered treasure was found in this area. The well where the treasure was found was part of a house within the Fatimid and Abbasid neighborhoods, built some 1,000 years after Herod’s reign, below the western façade of the Herodian temple. These neighborhoods also extended to parts of the inner harbor of the Caesarea port, which had already silted up by that time. Flat shaped nomisma histamenon of Romanos III Argyrus (1028 – 1034). Photo: Clara Amit, Israel Antiquities Authority. Michael Karsenti, CEO of the Caesarea Development Corporation, adds: “The treasure was discovered during the completion of a vast project we have been working on for more than two years: exposing the huge port vaults from the days of the peak of Caesarea’s glory. It is symbolic that the gold coins were discovered on the eve of Hanukkah. For us, this is certainly ‘Hanukah gelt,’ and a testament to how much more is still hidden within Caesarea. We invite the public to take advantage of the days of Hanukah to visit the site with their children and experience this fascinating find.” Karsenti emphasized that in addition to uncovering the treasures in the vaults of the Herodian Temple, development work continues at the site of the ancient synagogue whose mosaic floor has been partially restored. 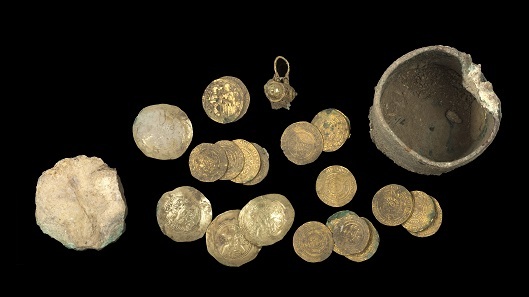 Details of new hoard. Photo: Clara Amit, Israel Antiquities Authority. Further information about the work of the Israel Antiquities Authority is available online.